Other names: segera, malasaging, mata-mata, bunyau, peler tupai, pisek, langsat-langsat, bajing talang, malatumbaga. Segera is a native of South East Asia. It is found in Brunei, Indonesia, Malaysia, Myanmar, the Philippines, and Thailand. 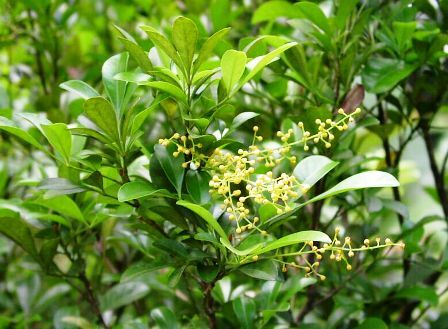 This tree is commonly found growing grows in primary and secondary evergreen forest, swamp forest, along rivers or roads and in periodically inundated locations upto an altitude of 2000 metres. It grows on all type of soils. 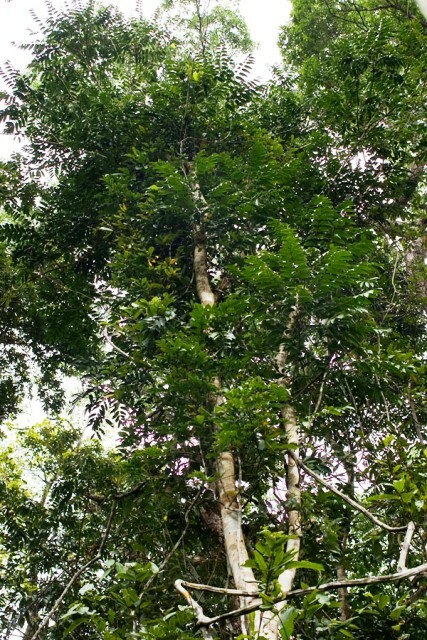 A small to medium-sized, sometimes fairly large tree up to 20(-40) m tall, bole branchless for up to 15 m, up to 60 cm in diameter, with steep buttresses up to 1.5 m high, bark surface dark reddish-brown or greenish-brown, inner bark magenta. Leaflets (5-)7-11(-15), subopposite to alternate, with 6-19 pairs of secondary veins, sometimes pitted, with numerous reddish-brown to pale orange-brown stellate hairs or scales, especially on the veins below; content. Flowers 5-merous, anthers 5, style-head ovoid or depressed globose, with 2 small apical lobes or a central depression. Fruit indehiscent, 2-locular, 2-2.5 cm in diameter, densely hairy. Seed 1, surrounded by the edible aril. 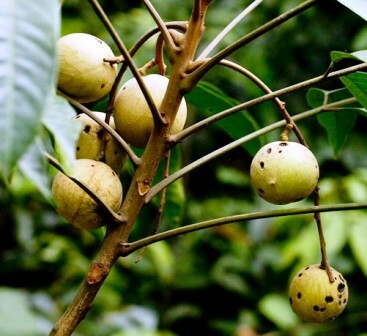 Fruits are edible and eaten by the local people. The tree, though planted as an agroforestry species, is not cultivated for the fruits. Bathing in water which has been boiled with segera tree bark, is prescribed to cure tumours. The leaves are applied to wounds for faster healing. The wood is hard and durable. It is used as timber in the Philippines. The wood is also used for furniture, general construction and agricultural implements.